I can't remember the last time I purchased tea from a store. Thanks to the internet, I'm able to get teas from around the world right at my fingertips. I've been online shopping for tea for several years now and the quality is so superb that the best place for a good cuppa by me is in my cupboard. I've blogged about a few online sites that I use already, but I just discovered a new one, Arbor Teas. Arbor Teas offers one of the Internet's largest selections of loose leaf organic tea and tisanes – two-thirds of which are Fair Trade Certified. They have selections from all varieties of tea (black, green, white, oolong and pu-erh) as well as South African rooibos, South American yerba mate and herbal infusions. I stick to the green, white and oolongs though. I'm really enjoying their USDA Organic Silver Needle White Tea and Organic Plum Oolong. What is especially unique is their 100% backyard compostable packaging! Composed of a cellulose film made from wood pulp sourced from sustainably managed trees, Arbor Teas' packaging can actually break down in a backyard compost setting. I have a compost bin in my kitchen and outside, which I mix with coffee grounds, used tea leaves after several steepings, egg shells, etc., so I love the idea that I can add their packaging right into the mix. 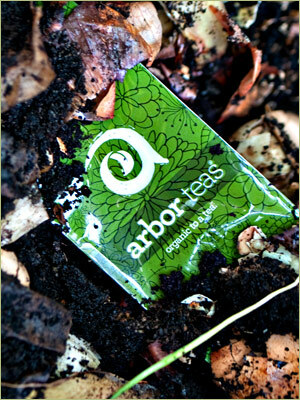 Depending on your location and weather, your Arbor Tea package should completely compost within 3 -4 months. When you go through as much tea as I do, it only made sense to start composting the tea leaves. I then spread the new soil around my rose bushes and trees. Related Post: What kind of tea are you?